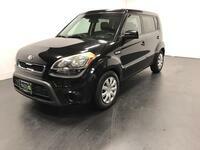 Are you looking for a used Kia model in the Longview or Texarkana area? We may have what you have been searching for at Autosmart. Our wide inventory of used models regularly includes a variety of Kia favorites like the Soul, Forte, Sportage, and more. Attractive pricing and available amenities that may be out of reach on newer models are just some of the benefits of purchasing a used Kia model. Most of our used Kia inventory is also backed with a free vehicle history report that can banish any worries of incomplete maintenance or flood damage. We pride ourselves on our quality and we do whatever we can to ensure that each and every person that leaves with one of our used vehicles is confident in their purchase. Browse our used inventory online or head over to our Longview dealership location at 1151 McCann Road in Longview or our dealership location at 3202 Summerhill Road in Texarkana for a more personalized shopping experience. While our inventory is always changing, we regularly offer a variety of used Kia models in our inventory including sedan options like the Kia Rio, Kia Optima and Kia Forte, crossover options like the Kia Soul, Kia Sportage and Kia Sorento, and even minivans like the Kia Sedona. If we don’t have the pre-owned model you are looking for, let us know and we can help source it for you. Used car shoppers can trust the Autosmart team to help them through the complete buying experience from model research to test drives, financing, warranties, and purchase. No more guessing about what vehicle you should buy, what a fair price is, or what you can afford. Our team can help with that! Give us a call or stop by one of our dealership locations in Longview or Texarkana and let us know what we can help you with.